Time Travel – Maine. Ocean. Camping. It’s still balmy here on Penobscot Bay. With all the activity swirling around at the campsites, it’s like we jumped into a time machine and popped out on July 4th. Last night we even had a group swim…I waded in about to my knees and that was enough for me. Without prompting, some of the kids went in for real…not just a quick dip but a serious, splash around, dive under sort of swim. On the first photo is Taylor Wardwell, her brother Rickie Perkins and friend Louie Pilat from left to right. In the background and on the right is Bryant Wyman. 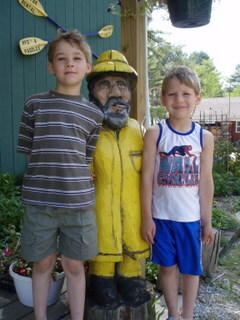 Bryant came from Benton Maine with his parents. Taylor and Rickie came from nearby Bucksport (remember the posting about the bridge?) with their grandmother. As far as I can tell, the trio haven’t stopped moving since they met up yesterday afternoon. Now the big buzz is tonight’s dance…the hottest feature seems to be the smoke coming out of the skull. This is Bob LaFontaine. This is the second summer he’s stayed with us and I’ve never seen him have a bad day… without exaggerating, he’s a positive soul from the tips of his toes to his big broad shoulders. When he’s not at the campground he lives in Belfast and runs the maintance program for the local athletic system. Here at the campground he’s the lawn man and our entire security department. He parks his trailer right in the middle of the campground and he’s our go-to guy for anything and everything. In the winter he’s active in the local snow mobile club and spends much of his free time fund raising for scholarships that send handicapped children and their families to summer camp. Finally, here are Shane and Colby Alley from Hope Maine. These two boys have won the award of the weekend for being absolutely, genuinely the politest boys in the park…and that’s not an easy designation to achieve because there are so many great kids here this weekend…I couldn’t begin to show you all of them. One of the nicest comments we hear regularly from guests visiting for the first time is how amazing to have so many kids in one place and yet we hear only laughter…no whines, cries or complaints. We’re not geared for entertainment but for discovery and that must be the difference…I’ll take some more pictures tonight and show you in the morning. In the meantime, check out the flicker album on the side for a few more from last night. Previous It’s Hot and We’re Ready! 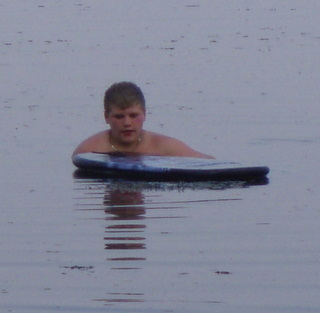 Hi There Searsport Shores, That’s Bryant Wyman from Benton, ME who came camping with his grandparents………. Thanks…I’ll make the correction…T’s and S’s…so close yet so far!